← Sadler Road closure this Saturday! 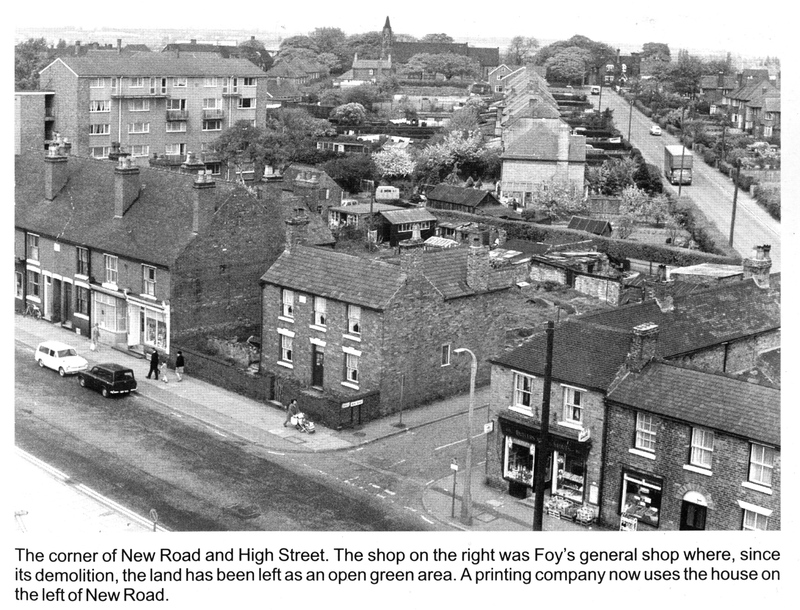 I thought it was about time we revisited some of the lost shops and stores in Brownhills. I’ve heard lots of people – particularly commentators here – reminisce about Selwyn Smith’s shop, and Cooper’s seems somewhat legendary, too. 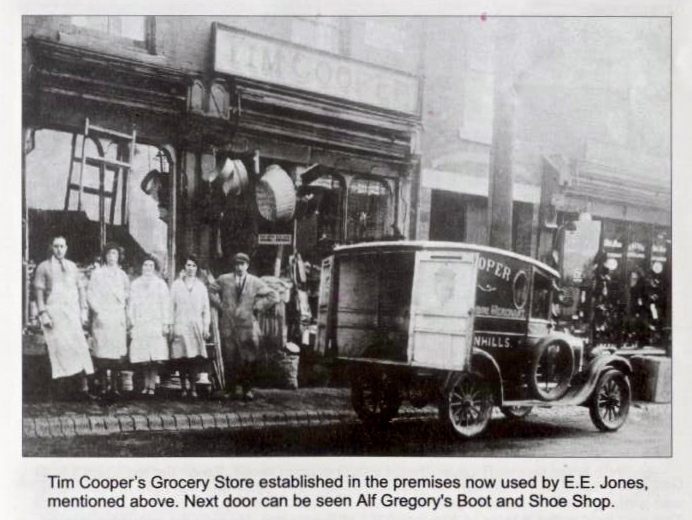 Was this the same Cooper family that owned the shop now converted to flats at the junction of Chester Road and Freizland lane? As ever, if you see any of the books mentioned here, do buy a copy. They’re as rare as hen’s teeth, and the work the authors put into them cannot be understated. I thank them all. Edit: 16th April – I’m having trouble with this post and formatting. If it looks odd, my apologies. Something, somewhere, is broken and I’m not sure why. I’m working on it. It’s incredible really, how little this scene has changed in subsequent years. Anyone remember the coal merchant that would be just out of shot on the right? From ‘Memories of Brownhills Past’ by Clarice Mayo & Geoff Harrington. Ice cream seems another recurring theme – recently we mentioned the unfortunate wartime demise of the Pelari carthorse, Selwyn Smiths is also mentioned a great deal. For my generation, it was Joes, which had a fantastic selection of seemingly exotic flavours, including a face-curling lemon sorbet. Fro ‘Memories of Old Brownhills’ by Clarice Mayo &amp; Geoff Harrington. I don’t remember ice cream vans looking like this – in my childhood there were two distinct sorts – the Walls vans who sold wrapped ices, not cones – the vans were yellow and white, with a distinctive three-note chime, and the Mr. Whippy type that sold soft, aerated delights. Taken from ‘Memories of Old Brownhills’ by Clarice Mayo & Geoff Harrington. I can’t really recognise this shop, it has changed so much. I love the old bubblegum machine and the shy-looking girl at the extreme right of the image. Did she sneak into shot or was her inclusion deliberate? From ‘Memories of Brownhills Past’ by Clarice Mayo & Geoff Harrington. Coopers is a mytery to me. Loads of folk mention it, and the family seem to have been notable locally, but I know little of them. I would love to hear your recollections. From ‘Memories of Old Brownhills’ by Clarice Mayo & Geoff Harrington. This entry was posted in Brownhills stuff, Environment, Followups, Interesting photos, Local History, Local media, Reader enquiries, Shared media, Shared memories, Social Media, Walsall community and tagged Brownhills, Brownhills local history, Clarice Mayo, Cooper's store, Crossway Stores, Geoff Harrington, Ice Cream, Ice cream van, Ices, Local History, Memories of Brownhills Past, Memories of Old Brownhills, Memories of old Brownhills by Clarice Mayo and Geoff Harrington, New Photos, Pelari Ices, Selwyn Smith, Staffordshire, Tim Cooper. Bookmark the permalink. I think the name of the Coal Mercahnts was “Tuckleys” or something similiar. I fetchedf coal from that yard in the old pram that me mom had (seen in the Holand Park picture elsewhere) used for some of the children.. I pushed it along the road from Catshill Rd to the coal merchants, he laoded it with a hundred weight (1CWT) and I pushed it back home then shovelled it in to the coal shed. Yes the coal merchant was Tuckleys. And the corner shop was run by Earnie and Annie Breeze who moved to Blackpool and ran a B+B. We went for many years on holiday there. This was after Foys. Selwyn ice cream shop was opposite our house and the Galleon fish and chip shop……the owners name was Harold I think…. My favourite shop was Toffee Roberts on the opposite side of the road by Elkins we used to get our sweets from there. Hi Christine, Just read your comment re Foys old shop on Brownhills High St, I am the son of Annie & Ernie Breeze, we moved to Blackpool in 1953. I lost contact with all my old school friends, but would love to know how they are all doing. they used to live in Freizland Lane, just up from the shop on the corner.in fact I was in a car crash outside Freizland Lane club,[now demolished] and I think it was Mrs Webster who took us in her house to wait for the ambulance, which was lovely of her as we were dripping blood everywhere. I remember Selwyns ice cream,but not the shop or those little vans,and I also remember Mr Whippy, a favourite and Tonibelle?.There was a song the kids used to sing but can’t remember it all “we love you Tonibelle, oh yes we do,….la la la la we’ll follow you la la …. oh Tonibelle we love you”……. someone may remember it? notice top/right in your first pic the flats in Wessex Close, now demolished, which I thought was a shame. my sister lived in one, overlooking the High street and it was a lovely maisonette.it was great watching the carnival go by from the balcony. Thanks and keep the old pics coming Bob, they’re great. I remember the coal merchant in Brownhills High street his name was Harold Humphries he retired about 1967 and his wife used to sell the coal, filling the scoop scales in the yard. I sent the scoop scales to the Black Country Museum. He had been there from the 1920’s. My father A J Wright took over the coal yard and delivered coal around Brownhills until 1988 when he retired. 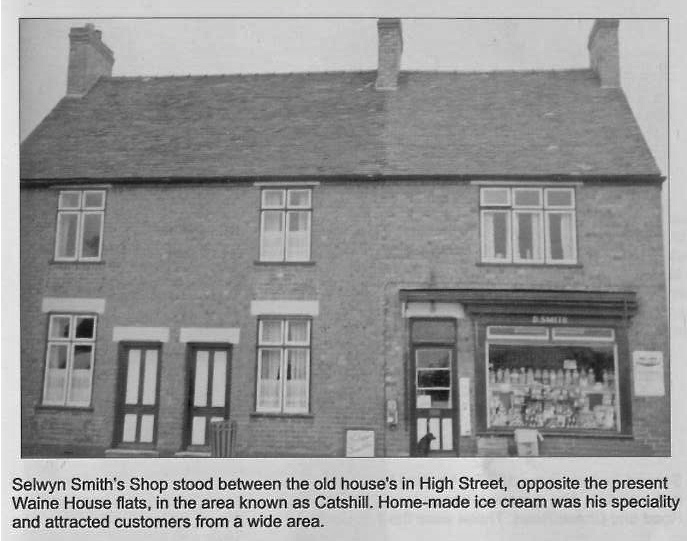 fascinated to see the picture of Selwyns shop, as i was born only a few doors away from the shop, at 281 High Street, and used to take a bowl to the shop to have it filled with icecream regularly. i think that i have a picture of me, with one of selwyns ice creams, taken about 1959.
websters coal merchants used to be in commonside? so my mom says. see also speaks of the butchers shop between commonside/lindon rd & anchor bridge. i remeber this also as a small child. the butchers shop in lindon road was Clentons, and coopers shop was the one on the corner of friezland lane and chester road. Mr and Mrs Cooper lived on chester road,shire oak, about number 40, i think. Websters owned the corner shop at the top of commonside on the Friezland lane, there coalyard if my memory is right, was in Clayhanger lane roughly by the corner of maybrook road. i remember Clentons shop well. Mrs Clenton was a teacher at walsall wood school if my memory serves me right. i think Clive is right about Websters owning the shop on the corner of Friezland Lane but don’t know if it was same family that owned the coal merchants. it was also run for many years by a family who lived in Friezland Lane,in one of the older houses about 2 doors away from the bungalow where ‘Paddy Walker’ lived. [The man mentioned in recent posts about the pit accident] i think their name was ‘Fillarty’ or something similar. Would you mind awfully if I posted the clip here, too? I’d like to use it here because Selwyn was a Brownhills institution, and many will be interested who don’t have Facebook. You must be a mindreader, as I was about to email you about it. No need to do anything, I can grab the video direct. 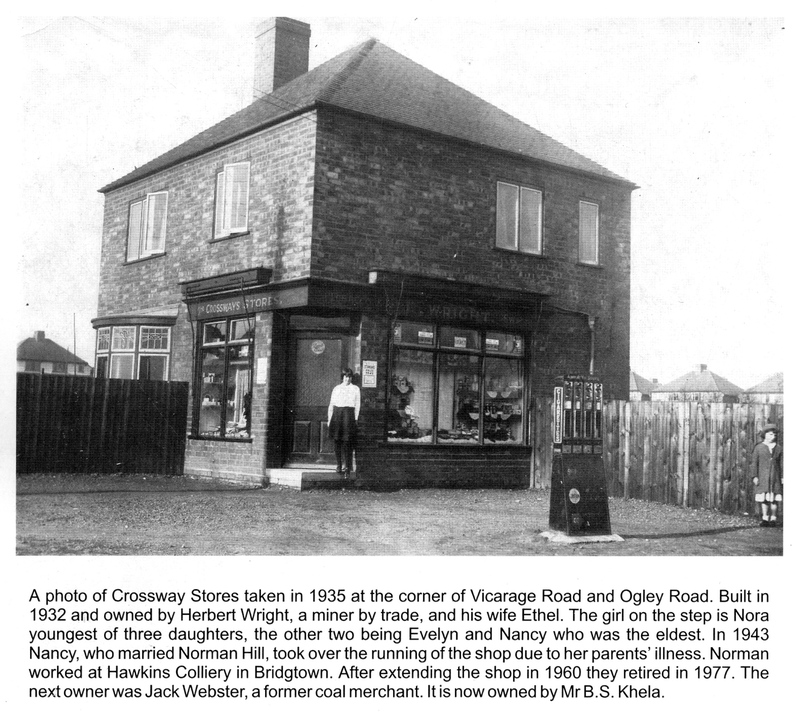 Does anybody have any photos or stories of the undertakers in Brownhills High street (woodhouse family) that was situated near to where the cancer research shop is ? I remember Pelari’s Ice cream vans – your pictures are accurate. They used to call in our road about every fortnight, but irregularly, you never knew if and when they were coming. The same driver came for years. Plus they occasionally had CIDER-flavoured ice lollies – I wonder what happened to them? 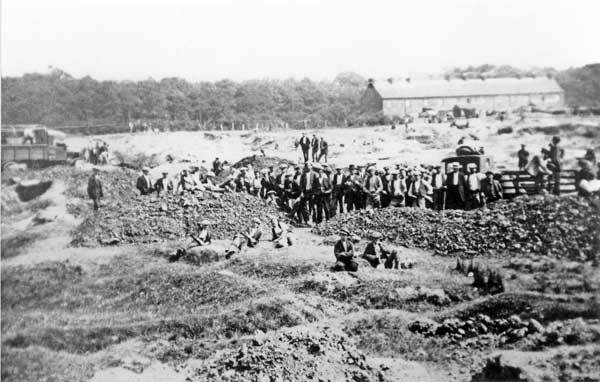 That’s thought to be Bug Row in the background, the men in the foreground miners coalpicking during the General Strike I believe. They would be standing on the site of the former claypit.